Since 1977, we have serviced and repaired Domestic cars, Asian cars, and European import cars. We believe in treating our customers with the utmost respect and have a reputation for understanding the problem and caring for our loyal customers. Our team understands the complexity of today’s vehicles. We help our customers understand what repairs and preventative maintenance they need and work within their budget. Al’s D & I Repair is a family owned auto repair business that has been in business since 1977. We believe in honesty and integrity when working with you and repairing your vehicle. No other Rapid City auto repair shop caters to your needs like Al’s D & I Repair. Whether you have a luxury import or are the proud owner of American muscle, Al’s D and I Repair provides you with full automotive service from headlights to the rear bumper. Our extensive training and decades of experience ensure you we have the know-how to tackle any problem – no matter the size. In business since 1977. We are the oldest independent auto repair facility in our area. Al’s D & I has won many local awards for the best auto repair shop. Al’s D & I uses the latest technology and employ top level ASE certified and experienced technicians. We Service Domestic, Asian, and European vehicles. Our staff is very experienced in the European nameplates, having worked on these types of cars for over 30 years. Our service writers are former ASE Master Technicians themselves and our technicians are ASE certified. This experience is extremely useful in understanding cars’ needs and being able to explain and make sense to the customer. Imports were considered almost “taboo” by repair shops in the 1970’s. We felt different about that for many reasons. These reasons encouraged us get involved with the imports long ago. As time marched on, our expertise developed with many lines of imports. Imports were the first vehicles with front wheel drive. Import vehicles also brought us Fuel injection. We had a major advantage over other repair shops when the Big 3 Domestic car makers finally used these technologies. The early years of learning imports provided us significant knowledge of how domestic cars evolved over the following years. Our techs are very knowledgeable by experience and know what brands of equipment and parts to buy and install that best suits these import cars. 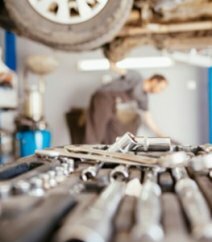 Al’s D&I Auto Repair service advisers work closely with our ASE certified technicians and customers to estimate and explain what is happening so the right repair is done. We strive for no comebacks, staying within our initial estimate, and getting your vehicle back as soon as possible. Our staff’s service writers are ASE Master Certified Technicians. Al’s technicians are ASE Certified with many having ASE Master Accreditation. We provide continuous additional education so all staff stay current with the industry. Our technicians are dedicated to continuous education and training programs for European vehicles. The cost of repairing today’s vehicles is expensive, Al’s offers competitive pricing on all our repairs. We have a NAPA Peace of mind warranty that offers a 12 month/12000 mile nationwide warranty that travels with you. 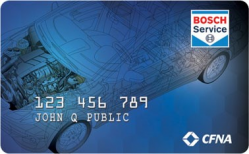 We have a new relationship with Bosch that will allow us to offer financing with APC for 6 months/no interest.